We know that you, of all people, understand the need for good teaching materials about Native American people and culture. You who are teaching in Indian country are no doubt aware of the richness of our cultures, and you might even know of award winning teaching materials produced by Native American educators that somehow do not get implemented in the schools. Cradleboard too sees great potential right in our own midst. The Cradleboard Teaching Project addresses two problems - one in Indian country, and the other in mainstream schools. We use one problem to solve the other. Native American people suffer from being misperceived all of our lives. Non-Indian children and their teachers want to learn about Native Americans, but are handicapped instead by dull and inaccurate materials without ever encountering any Indian people. 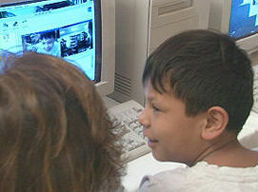 The goal of the Cradleboard Teaching Project is to raise self-identity and self-esteem in present and future generations of Indian children by putting Native American educators into the driver's seat of delivering accurate and enriching teaching materials into the hands of teachers in all American schools. The Cradleboard Teaching Project provides an aboriginally developed and enhanced interactive multi-media Native studies curriculum for use in elementary through high school level. Instead of studying dead text handed down by generations of unknowledgeable educators, Mainstream kids can now partner with a distant Native class, as both study Indian culture together. The children use the new interactive technologies alongside traditional methods of delivery. It is our hope that the positive effect of the distant partnering will also result in cultural bridges at the local level, smoothing the way for good interaction between Indian and Non-Indian children who are neighbors. Now at last the brilliance and contributions of Native American educators and cultural resource persons can be shared with those beyond our own communities, to shine a light on the positive realities of which you are already a part, for the benefit of children near and far.